I know that a lot of people are already done with their holiday, it being February and all. But, I also know quite a few of you who are planning your trips for 2017 already!!!! While I am not going to be traveling for a bit, I am going to be doing some travel related posts, some outfit posts (yaaaay!!) and some design posts. I took my first long haul flight from Addis Ababa - the capital city of Ethiopia to Bangkok. It's easier said than done to sleep throughout the flight. My feet get numb and swollen and I have to keep my feet up which is difficult because, well, flight. I have other issues - my attention span is negligible, my skin becomes dry and that makes me irritable for reasons beyond me. 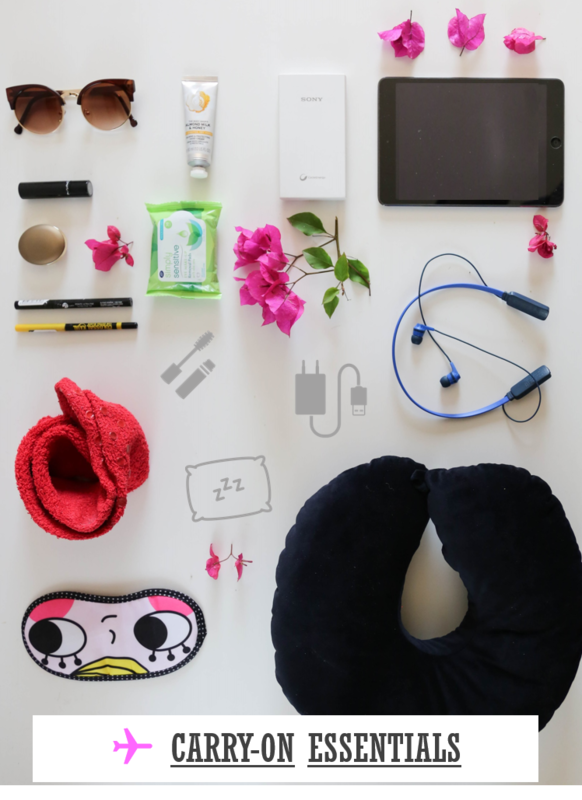 I have put together a list of all those essential items you should pack - especially on a long flight. I've added the details of the items at the end of the post. I like to carry warm socks to keep my feet warm. The moment I get comfortable and settled in on a long flight, I take my shoes off and put my socks on. I got my pair from La Senza - I know the brand is synonymous with amazing lingerie - but they have the most comfortable pair of socks ! I always carry a cardigan - I need something to snuggle in. Even when the AC is turned off, I like a layer. I really think staying moisturized is key on a long flight. The cabin temperature is always cool which makes the skin dry. I carry a hand cream and a body butter (remember you can't carry liquid containers above 100 ml). I usually buy my hand creams and lotions from Body Shop, and recently I bought an entire tarvel kit from L'occitane. (below). 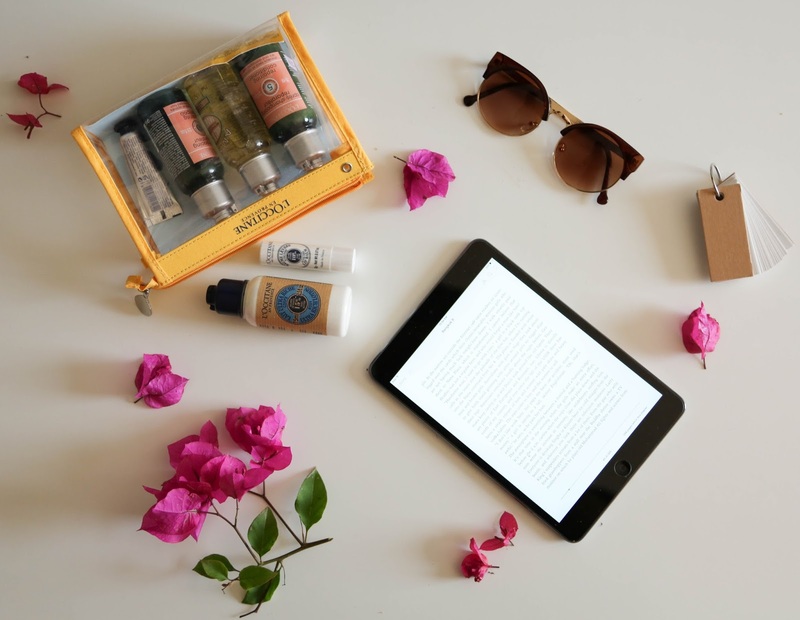 I love L'Occitane - and their travel kit is really convenient. I also have a lip balm, lipstick and kajal in my bag as these are quick makeover essentials after a long flight. A lot of people I know carry a lot of other make up - but since I am more of a 'less makeup' person - I am good carrying just these. I usually carry a sleeping mask and a neck pillow to sleep comfortably. I for one can not fall asleep even if there's a splinter of light around. I also suggest carrying a book / magazine or having an E-reader (Ipad / Kindle) for those beautiful morning hours when you can't sleep. Carrying wet wipes are another good idea. I carry the smaller pack (for eye makeup removal) but it can be used on the whole face. This is only to save some space. Finally, the powerbank. The last thing I need is phone/ipad with low battery in a new place. My headphones are from Skullcandy. They're wireless and quite comfortable. You can find it here. You can find a similar sleeping mask here. Wet wipes are from Boots but you can find it any pharmacy. I love those glasses - they're from Dulce Couture. The lip balm is from Forest Essentials - it's a subtle sugared rose petal.